From the Breviary according to the use of the Roman Curia, 1529, the beginning of the sermon for the sixth day in the Octave of All Saints. On this day, most beloved brethren, we celebrate the particular festivity of the heavenly Jerusalem, our mother, and venerate the most worthy society of the Church Triumphant. Just as Eve was created out of the side of the sleeping Adam, so also the Church, the mother of all believers, was redeemed and brought forth and grew from the side of Christ as He slept on the Cross. By Her permanence within the ark in the midst of the flood, He foretold that She would preserve the aid given Her by the Cross, and the mystery of Baptism. Let these things, most beloved brethren, be heard and understood, and because they are great to you, let them seem greater in these mysteries. For with solemn rejoicing we celebrate the new dedication of a temple that was formerly filled with idols unto the reverence of God and the Saints. Through this are designated our liberation from the power of the devil, and the dedication of our souls as temples of God in the washing of baptism. Since we have received this benefit from God, we are admonished that in our hearts, after casting out the idols, we must make firm the constant memory and example of Christ and the Saints, so that we may finally be able to enter the heavenly wedding banquet with them, forever to praise God. This is the sixth year in which we will keep the feast of All Saints by following a sermon from the Roman Breviary of 1529. On the feast itself and each day of its octave, the sermon for Matins follows the same pattern. 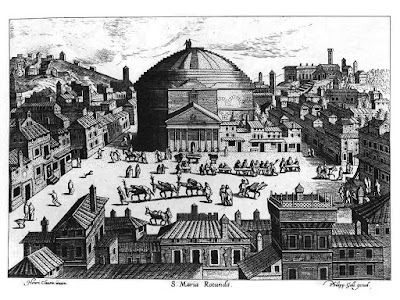 The first lesson is about the institution of the feast on the part of Pope St Boniface IV (608-15), when he dedicated the Pantheon in Rome as a church. 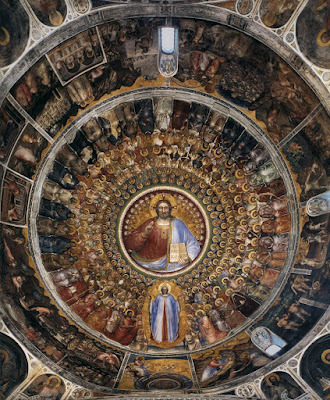 The second lesson is about God, and is followed by six lessons that descend though the hierarchy of the Saints: the Virgin Mary, the Angels, Patriarchs and Prophets, Apostles, Martyrs and Confessors. (Virgins and other holy women are usually mentioned along with the Virgin Mary.) The ninth reading is taken from a homily of St Augustine on the Gospel of the Sermon on the Mount, Matthew 5, 1-12; I do not include these ninth readings in this series, since they can easily be found in the Breviary of St Pius V.
A mid-16th century engraving of the Pantheon, labelled at the bottom “Sancta Maria Rotunda - Round St Mary’s”. This nickname was very commonly given to the church in the Middle Ages, but its official title was and remains “Sancta Maria ad Martyres - Saint Mary where the Martyrs are.” This latter name refers to the tradition that when it was dedicated as a church, Pope Boniface IV placed the relics of hundreds of martyrs in it, having removed them from their original burials in the various catacombs outside the city.